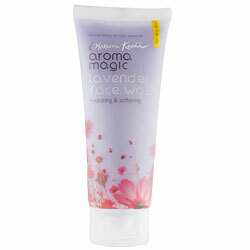 Aroma Magic Lavender Face Wash for dry skin - Prevents Ageing, Clean, Soothe & Refresh Your Skin. For dry skin. 100% free of paraben, soap, alcohol, artificial colouring & fragrance. 100% free of paraben, soap, alcohol, artificial colouring & fragrance. Clean, soothe & refresh your skin with lavender extract & nourish it with ultra whipped shea butter. Anti oxidant in orange extract prevents ageing. Shield your skin from minor irritations with blend of lavender & rose essential oils. Free from paraben and other artificial ingredients. Makes skin soft after wash.
Creamy texture which is easy and smooth to apply on moist skin. Thoroughly clean impurities from skin thereby making it clear and glowing. Apply to moist face & neck. Massage gently and rinse off. Use it every morning and night, moisturize your skin and use sun protection for best results.